Madeline often pretends that she has her own little house under our barstools. And lately, Mason has been joining in the fun. Sometimes he will crawl over, pull up on the bars and stand up. But then he realizes that he can't get down and he cries for help. 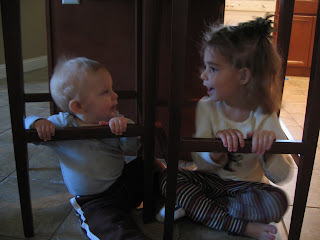 Yesterday, he crawled up inside the barstool and sat there contentedly while Madeline played house with him. He didn't interact much but he had fun gnawing on the bars and watching his sister talk and make "pancakes". 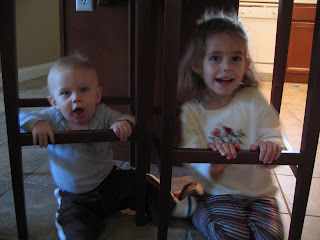 Now this looks like every child's dream...under the kitchen counter "hiding"! This children are so darling...I could just sniff them up! Tell them Grammie and GranBud love them dearly and miss them. 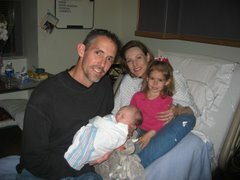 Thanks, Steph, for doing such a great job of keeping us grandparents and friends up with recent photos. You are so sweet! And, Jay, also! Tell him and give him a hug from us!